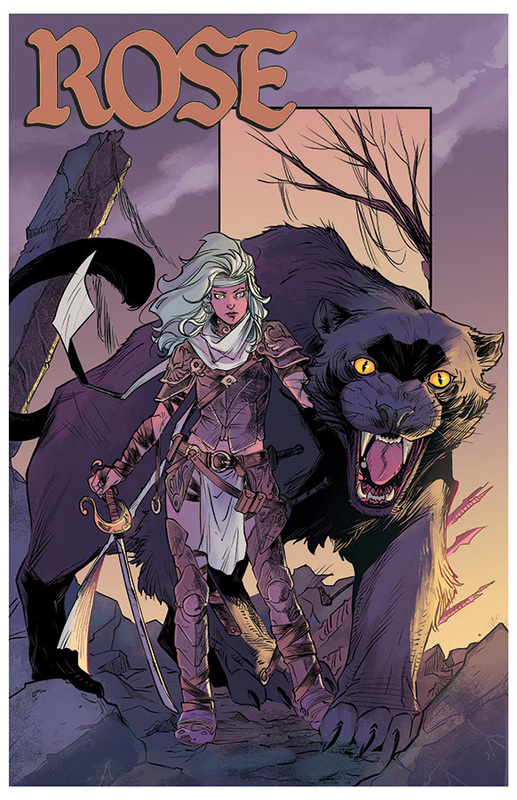 Image Comics has the pleasure of releasing Rose #1 and at first glance it looks fantastic. It’s set in time of fantasy and where magic has been outlawed by a villainous queen who wants to rule all. Finch sets the stage by telling us about the Khazt. They happen to be magically powered beings that have a spirit animal or a real animal companion. They have been gone and forgotten. The queen simply kills anyone that has the potential to be a Khazt. This story seems familiar to me in several ways. I love comics especially ones that can relate to movies more so. Rose has elements of Willow, Golden Compass, and Conan the Barbarian to a point. What I like about the story is that I can see the story in my head as I read and look at the pages. The artwork is really detailed and the figures are flawless with excellent facial expressions to impress even the casual reader. The main character Rose is a fiery red-head that has budding magical powers that the queen will want to extinguish. This first issue is an excellent introducing to the good guy, bad guy, and even several side characters that will continue with us along for the ride. I look forward to the next issue and hope it’s just as good a read as the first.